Heavy purses are the pathway to pain! The purse of today has passed by the tasteful clutch of Audrey Hepburn, skipped past the utilitarian hand bag of your mom and stomped into the realm of back-pack carry all of GI Joe. Stuffed full with mobile phone, iPad, umbrella, diary, make-up, book, water bottle and yes, it is true often another purse. It is not uncommon to find women toting around bags weighing more than 15 pounds. Is this a bad thing? When has being prepared ever been bad? Plus, imagine all the extra exercise achieved by lugging around a heavy bag. The problem centres around the compensations we make in posture to carry these bags and the injuries that develop over time. The first compensation is at the top. When carrying a bag, the head and neck naturally leans in the opposite direction to help offset the weight. This creates tension on the side of the neck with the load and compression of the joints on the other side. Unfortunately, the brachial plexus (the bundle of nerves that travel from the neck down the arm) is also where all this stress is being placed. Aside from compressing this bundle of nerves we can also cause neck pain and muscle inflammation. This problem can manifest itself as chronic neck pain or blow up into an acute episode of neck spasm. Usually there is the complaint of a nagging ache that runs down the neck, across the top of the shoulder blade, and over to the arm. This curved crescent of discomfort frequently gets worse and worse until one day a trivial movement causes sudden agony with muscle spasm, pinched joints and irritated nerves. The shoulder carrying the purse is elevated and rotated either forward or backwards. The muscles supporting the spine, shoulder and upper back will eventually tire and spasm. Fatigued muscles dont hold the spine correctly, creating poor posture and overloading of the spine joints. Over time, the joints of the spine wear and this can lead to premature arthritis. Even the discs, the cartilage cushions between the vertebrae, can start to degenerate. If the disc structure deteriorates enough, a painful herniation of the inner disc pulp can develop. Our arms are meant to swing while walking to create a natural balancing mechanism. When carrying a bag, that arm remains relatively motionless to keep the load under control. Disrupting the normal walking mechanism creates an unbalanced walk, which creates a greater physical toll on the rest of the body. Carrying a bag in the crook of the arm rather than the shoulder can lead to overloading the bicep causing fatigue and tendonitis. The body compensates for the altered balance of the gait by taking shorter steps. Couple this altered gait with the extra load placed on the hip and knee joints from the overloaded purse and the legs are working much harder to walk than necessary. These compensations are even more pronounced when you throw high heels into the mix. The sad truth is that the fanny pack of yesteryear was the best way to carry a purse. Assuming that isnt much of a solution for you, then there are other strategies that can be employed. Limit the load: Do you really need to carry a water bottle with you? Are you travelling that far from civilization? Switch it up: Move the bag from side to side at regular intervals; give the muscles a chance to rest. Wide straps will better distribute the pressure of the bag across the shoulder. Keep it close: The mass of the bag should be kept close to your centre of mass like a fanny pack. Remember the mailman: A satchel bag with the strap across the body can better balance the weight. Strap it short: Long straps lead to the bag bumping into your hips and the momentum of a swinging bag leads to imbalance. The American Chiropractic Association recommends a bag weighs no more than 10 per cent of a persons total body weight (between 12 to 15 pounds for the average woman). Get military: Throw the shoulders back and the chest forward; avoid the slouching posture that shoulder straps encourage. Balance it out: Try carrying a bag on one shoulder and a short-handled tote in the other hand, so youre balanced. Warning signs that you may be on your way to a big-bag injury include an ache in the shoulder blade area and frequent neck stiffness. Headaches and pain radiating down the arm are also symptoms. At Andolina Chiropractic & Rehab of Woodbridge, it is far too common to see women carrying purses up to 20 lbs. For some reason, women think it is necessary to carry all of their belongings in their purse. Men don't have an issue with just carrying a wallet. I know that there are certain products that women must carry that men do not, but try not to get carried away and think that just because there is room, you should fill the space. The heavier the bag, the higher probability of muscular/postural imbalances and an increase in pain. Keep it simple, and keep it light! 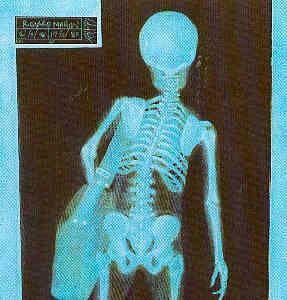 Above you see the X-Ray of a person carrying a large purse. You can see how much your body has to compensate for the weight. Over time this can cause injury and chronic pain. If you notice that you are starting to have pain in areas noted in the article above, schedule treatment at Andolina Chiropractic & Rehab of Woodbridge at 703-490-8383 or online at www.AndolinaChiropracticRehab.com.